Identify sags and other potential flow problems by viewing inclination across the length of a section. 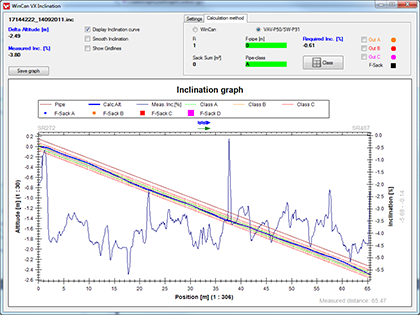 Inclination data is read from any properly equipped inspection crawler, and then displayed as a line graph. It is stored with other section data, and can be printed as a PDF report. For safety, an alert can be activated for excessive inclinations.